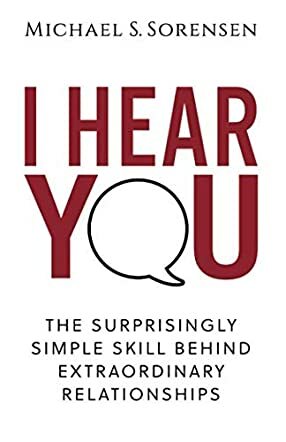 I Hear You: The Surprisingly Simple Skill Behind Extraordinary Relationships by Michael S. Sorensen is an insightful book for all those readers who are looking to improve their relationships, increase the likelihood that people will listen to their advice, enhance their ability to support others during difficult times, and help to navigate easily emotionally charged situations. The author introduces readers to the most powerful of communication skills, validation, and his techniques and tips help quickly resolve or prevent arguments, help others become open to our viewpoint, calm the fears, concerns, and uncertainties of others, give useful advice, and provide support and encouragement to others. The author’s personal experiences are palpable to readers and these make his words more authoritative. All the tips are simple and easy to incorporate into our lives and will help us look at our relationships in a positive way and make necessary changes. The book will help us understand the importance of validation in building up healthy and satisfying relationships, and the suggestions are good to make each of us into a good listener and a great validator. The author's words apply to any relationship in our lives and can be used to enhance and nurture relationships in a healthy way. The simple strategies shared are effective and the step-by-step tips are good to develop and nurture healthy human connections. Reading the book will encourage and motivate everyone to change by using the practical approach given by the author for daily interactions.